A lighter and more autumn-y take than my spicier & more robust mulled wine from last year, I concocted this version for a friend's pre-Thanksgiving/housewarming potluck celebration this past weekend - partly because it was going to be rainy (warm cocktail would be a major plus) and there were more than a dozen attendees (so I'd much rather do a batched cocktail rather than making individual ones) and because I was late to RSVP, and almost all the other appropriate food dishes (from appetizers to sides to desserts) have already been spoken for, but no one took the cocktail slot. What better way to show off my amateurish mixing abilities, or how much of a lush I am. And, actually I'd consider a "new & improved" version of the mulled wine. It still has the bite of the sweet spices (maybe even a little more so, since I used fresh ginger this time,) balanced with the breezy fruitiness of apples and pears (which I kicked up another notch with apple juice & pear liqueur.) 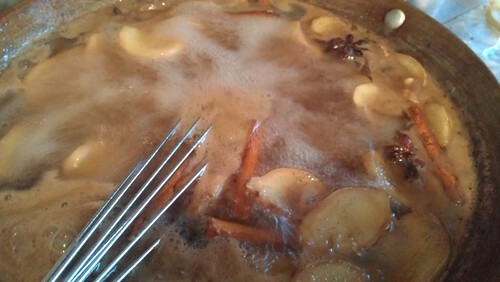 Plus, being a slow cooker recipe, it's one you can have simmering throughout the party and just have guests ladle away. 1. 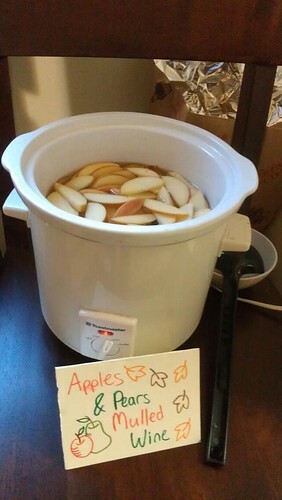 Combine apple juice and water in a saucepan over medium heat, bring to a gentle boil. 2. Add sugar and stir vigorously until combined, then add ginger slices, star anise pods, cinnamon sticks, ground allspice and nutmeg. 3. Reduce heat to low and allow it to simmer for about 15 minutes. 4. Turn off heat and add half a cup of pear liqueur. Proceed to making mulled wine or store in the fridge. 2. While the mulled wine is heating up, rinse, core and chop the apples and pears into thin pieces/slices/wedges. Add to slow cooker, cover it and allow to heat for approximately an hour. 3. Add the remaining half-cup of pear liqueur just before serving. You can leave it on the low setting, or dial it down to the "keep warm" setting, for the duration of serving. When I first received the invite to try out Cecconi's Ricotta Pancakes, I'll concede my first reaction was an indifferent "Ok, well good for them." I mean, I love ricotta pancakes and their airy-light, creamy-rich and slightly chewy texture, but they are kinda all over town. However, upon closer inspection of PR pitch and realizing that these are actually cheese-stuffed pancakes with "ricotta oozing out," my curiosity got piqued and so I went there for a hosted sampling with The Minty and Dishing Up Delights. 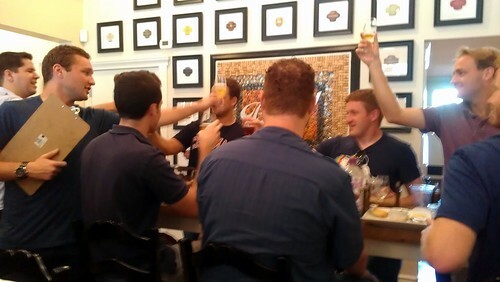 Of course, this blogger meetup turned out to be more than just a pancake tasting . . . it was a boozy brunch feast that left all of us rolling in satisfaction. 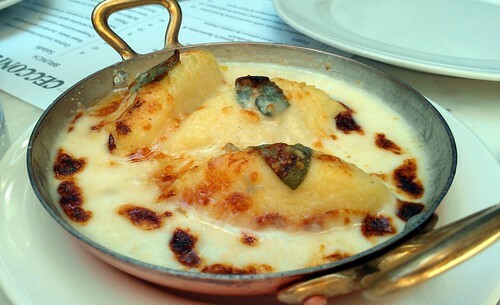 But being carb-fiend that I am, my favorite small plate was definitely the gnocchi [alla] romana with gorgonzola. The fluffy, oversized dumplings went wonderfully with the stretchy, rich and ever-so-mildly-bluey cheese sauce, the baked-on sage added a nice aroma to boot. And actually I think it's a smart move to keep this at a manageable cicchetti size, 'cause as indulgent as these things were, I don't think I can handle even a primi portion of it. 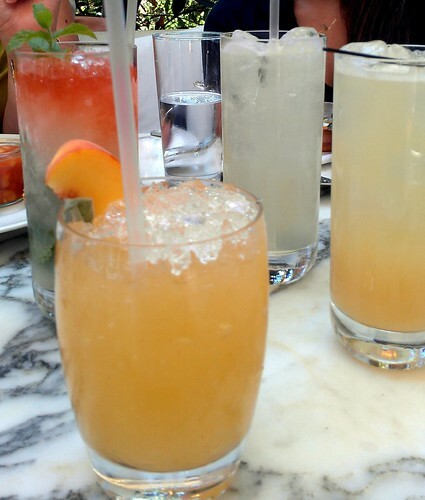 At the risk of sounding like a Semi-Ho, it wouldn't be a proper brunch without a some libations. But unlike Semi-Ho, our cocktails were actually respectable sippers - all leaning on the breezy and refreshing side, such as classic Moscow Mule and Queen's Park Swizzle. I opted for a more modern Rye whiskey-based Peach Smash, a simple-yet-effective summery cocktail that's equal-parts spicy, spritzy and fruity [without being too sweet.] Alas, with peaches going outta season looks like I'll have to wait till next year to re-embrace this particular drink. Next up came our savory entrees; while I did enjoy my wood-baked frittata with pancetta & mushrooms, the clear standout is definitely their potato rösti topped with a sunny-side-up duck egg and black truffle shavings. 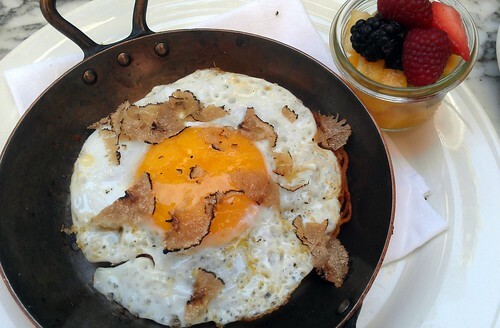 It's a seductress of a morning dish that tempts all the senses, with its more-orange-than-yellow yolk, intoxicating truffle perfume, and clearly audible crisp with each cut & bite of the rösti. You can only imagine how it feels & tastes . 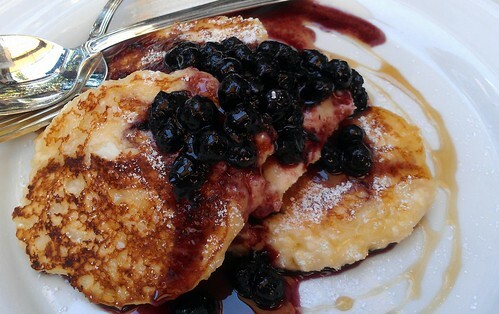 . .
And then, the dish we were all looking forward to - the ricotta-filled hotcakes with blueberry compote. Consider my curiosity & palate thoroughly satisfied . . . these were amazing-tasting lovechildren of cheese blintzes and ricotta pancakes. In fact, I'd even say they one-upped their parents, since I've never cared much for blintzes (too much cheese for the thin crepey pancake) and as tasty as standard ricotta pancakes are, the back of my mind is always wondering "Ok, where is the actual cheese?" The compote here is solid stuff too, vibrant with blueberry flavor and adorned with lots of succulent berries too! Finally, even though we thought we just had dessert with the hotcakes, the Chef sent out a sweets sampler platter with all sorts of fun bite-sized sugary treats. 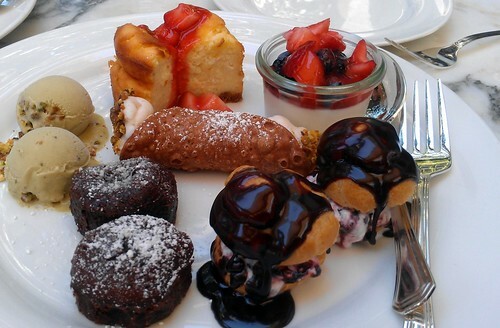 Since I'm already on a ricotta kick, I loved the mini canoli and light-than-usual cheesecake best. (Tip: I was also informed that this can be ordered as an off-the-menu special.) Oh, if only people can hand these out instead of waxy, bland, [not so] fun-sized candies during Halloween . . . But all in all, color me a convert of brunch @ Cecconi's. The price is a tad upscale, but the premium is well worth it particularly for a special occasion brunch. The food was solid and the service impeccable (not just for us blogger folks, I've been observing our dining neighbors too...) and the patio setting, surrounded by high hedges and topped with a frosted skylight, made for a great respite from its noisy, urban surroundings. And you can definitely count on me to return for that gnocchi, rösti and hotcake! - In a two-star review, LA Times' S. Irene Virbila noted that "with the possibility of half-portions, thin-crusted pizza and moderate prices, I'm betting this user-friendly Italian will have legs." - Gayot declared it a top 10 Italian & celeb-spotting restaurant for 2011, adding that "far from the molecular-minded trends of today's dining scene, Cecconi's feels classic and timeless." - In the write-up to accompany its now-expired deal, Gilt City L.A. says it "is one of the city’s most glamorous Italian restaurants, reprising the original Cecconi’s London that hosted royalty throughout the ’80s. 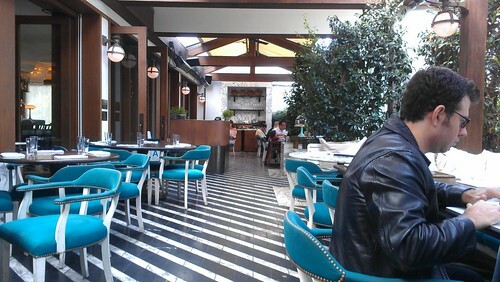 The L.A. version caters to more modern aristocracy." - Deep End Dining got an alien autopsy/squid ink extraction experience here, then enjoyed a "truly exceptional" squid ink risotto with clams. But alas, not all Dr Chocolates are alike, and I figured it'll be fun every now and again to blog about my recent therapy sessions, if they were worthwhile and whether I'll book another appointment again. Physician Marketing: "The Caramel Toffee bar is infused with a crunchy, salty toffee, crafted from a third generation recipe. We've added pieces of pecans & walnuts for extra crunch and even more rich flavor. Both of these are artisan-made chocolates for which you might expect to pay art-gallery level prices." Patient's Notes: A thinly-veiled partnership/copycat of Vosges' Exotic Caramel Toffee Bar (down to the "third-generation" part, Vosges' site noted the toffee is a tribute to the chocolatier's grandmother). The major notable difference between the two is cacao content (70% for the TJ bar, versus 45% for Vosges.) Which wound up being my major gripe for this bar--I generally gravitate towards dark chocolate but this is one exception where "deep milk chocolate" worked so much better, with its creamy, subdued character blending harmoniously with the buttery toffee and softly-crunchy nut bits (and I do mean bits, those looking for significant chunks of nuts should find another therapist.) With the dark chocolate, the bold, intense cacao flavor kinda works against the other components of this bar. However, the major bonus is that this is only a $2 (versus $6-8 for a Vosges bar of the same size.) I can readily overlook the more intense, possibly harsher, taste for that price. And it's probably slightly healthier too, what with all those extra antioxidants in dark chocolate. Physician Marketing: "Peppermint cool-kisses the milky mist of Matcha in a rich raw cacao, merging the two most anti-oxidant rich foods on the planet." Also, note that their marketing includes having a "bite" taken out of the chocolate bar to symbolize their charitable commitments. Unfortunately, when I opened this bar, I discovered that it had bloomed and the texture was definitely less-than-ideal--slightly grainy instead of the expected silky-smooth. Thus this became more a chocolate that I chewed instead of letting it sit on my tongue to melt. But having said that, the flavor is a pleasant surprise, with the cooling mint and roasty green tea coming in delightful wisps and tinges and surprisingly well-synced with the fruity notes of the chocolate itself. Likelihood of Rebooking an Appointment: 7/10, though might adjust it higher/lower depending on if next bar's bloomed too. Physician Marketing: "A chocolate bar with a kick! We infuse our decadent dark chocolate with Ancho and Chipotle chiles, resulting in a bar that features a finishing hint of spice, just as chocolate was originally enjoyed." Patient's Notes: I'm a lover of spicy chocolate (be it from chilies, ginger or even wasabi) so I'm always on the lookout for new varieties to try. This particular bar is a great one to try even for the heat-averse, with just a slight, lingery kick and a little roasty smokiness. The chilies also does a great job complementing the chocolate's aroma (strongly advise you rub the bar & have a sniff before taking a bite.) Finally, I love how incredibly smooth this bar is. Just let it sit in your mouth and let the mini-fireworks show commence on your tastebuds. The only ever-so-minor demerit is that this is one whole bar (as opposed to sectioned off squares like the other two above) that makes portion controlling just a wee bit harder. Likelihood of Rebooking an Appointment: 8/10, though I got this bar in Portland and doesn't seem likely I'll find it in a store in Southern California. As "dine/drink out" foodbloggers, we are almost always on the prowl for the new & exciting places to check out - be a restaurant that finally opened (after months prolonged anticipation due to permit-related delays), a food truck that's hitting the road or a pop-up featuring a guest chef and an eclectic menu. And while it's great to constantly discover new gems in this ever-changing dining landscape, the big downside is that there are very few places where we can be regulars. And worse yet, sometimes we just overlook blogging about these favorite spots--whether because it lacks the razzle-dazzle of simply being new or maybe because we subconsciously want to keep it a lower-key hang out just for those in the know. 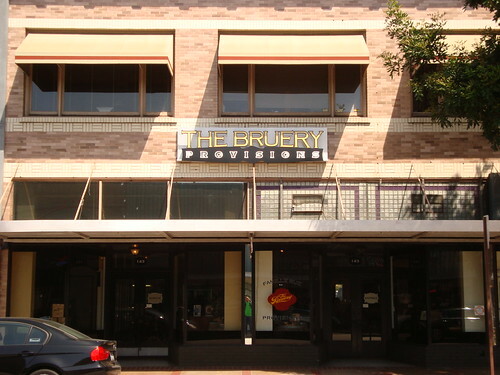 The first of these regular haunts that I'll highlight, Bruery Provisions in Old Town Orange - the more consumer-friendly space of the Placentia-based brewery that's great for beer enthusiasts who want to sample and learn a little more about crafty beers. For those unfamiliar with Bruery beers at all, I highly recommend their $3 standard flight, featuring their five of their year-round beers like Saison Rue & Loakal Red. From there, move on to their $5 specialty flight that's constantly changing (and my usual go-to), sometimes it'll have seasonal releases like Autumn Maple, or it may be their limited-edition beers such as their anniversary series, or collaborative projects with other craft breweries or even home brewers. Even for those who know their Bruery beers up and down the wazoo, Provisions offer at least 2 rotating flights highlighting beers from other worthy breweries, usually organized around some sort of theme such as geographic region, beer styles, best of the season, etc. And if you got company who are especially beer-averse, they offer two wine flights too. 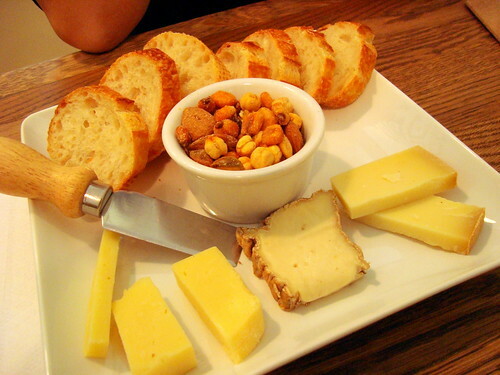 Also noteworthy is their variety of sophisticated small plates, also assembled as a flight of different bites, from exotic charcuterie and eccentric cheeses to artisanal olives and specialty preserves. Great noshes to go with beer or on their own. - KevinEats went there for a beer & cheese event organized by Marian the Foodie, and said "the beers, of course, were unique and delicious in their own right, but it was perhaps even more interesting to see how their flavors were enhanced, tempered, and complemented by the paired cheeses." - DineDelish noted that this place "would be heaven for anyone trying to host and wine and cheese party or any exotic beer enthusiast. 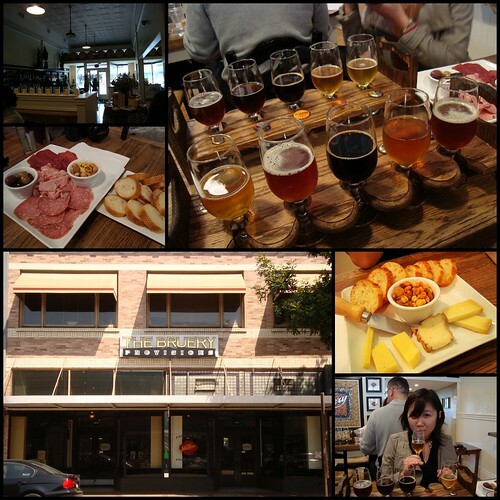 The prices are affordable and trying out a cheese tasting or wine and beer is really fun." 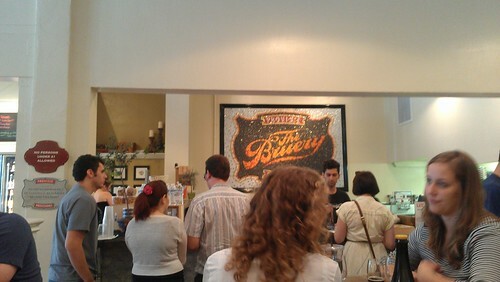 Upon arrival, I took notice of the place's interior. True to its name, it has a rustic-country farmhouse feel with a few modern touches here and there, such as studio lights juxtaposing against vintage family portraits and assorted wall curios. 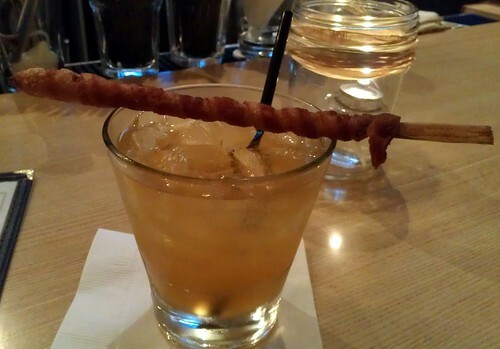 While waiting for the dinner to commence, I settled into the bar and got a cocktail, the Buffalo Smoke made with Buffalo Trace Bourbon, St. Germaine, peach nectar and a bacon-wrapped sugarcane. The drink leaned a bit too sweet for me at first, but it later proved to be a nice contrast against the smoky, savory bacon. Of course, it's also ingenious for being a cocktail I can drink AND eat at the same time! After a while (and a few small bites to keep our appetites at bay,) we were escorted into the Parlour Room in the back for our dinner. As I noted, what sets American Farmhouse Tavern apart is the complete meal menu, where almost every entree includes soup, salad, choice of side AND choice of dessert. And the four-course dinner is totally worth the bang for the buck, ranging from $13 for a Linguica Sausage sandwich to $29 for a bacon-wrapped filet mignon. 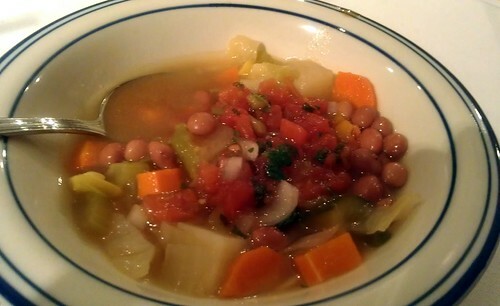 Farmhouse vegetable stew with cattleman beans, Santa Maria vegetables in broth and Santa Maria-style salsa that you get to combine to your liking. 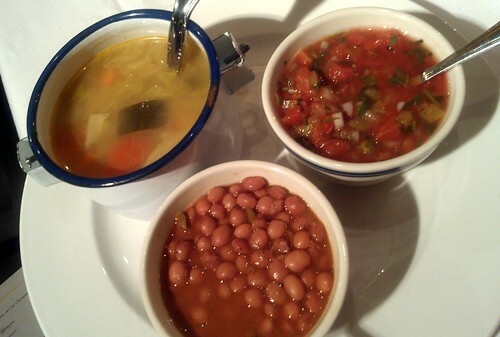 This starter was a delightful mix of contradictions, with the delicately savory broth set against the zesty pico de gallo-esque salsa, and the rich, hearty beans. Of course, I appreciated the "customize-your-own" aspect. As you can see, I kept mine on the light side with way more broth & veggies -- since I know there'll probably be plenty to nosh on later. After the soup came the wedge salad, which was another much-welcome surprised. 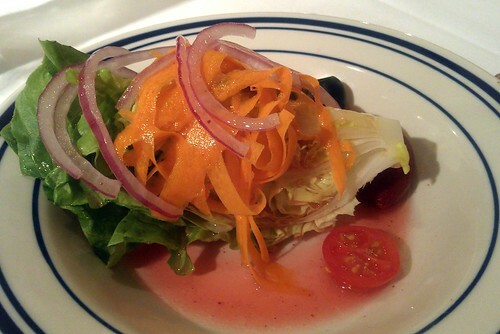 Whether than the typical wedge of milquetoast iceberg lettuce & bland tomato drowning in a heavy Bleu Cheese dressing, here it's a flavorful blend of Bibb, grape tomatoes and carrot-onion strips in a tangy-spicy Cabernet Vinaigrette. Normally another pet peeve of mine are salads that I have to use a knife on, but I definitely didn't mind cutting this up and eating all those tender, crunchy, flavorful layers of vegetables. After that came the trio of entrees, which I was more thankful to split with my +1. 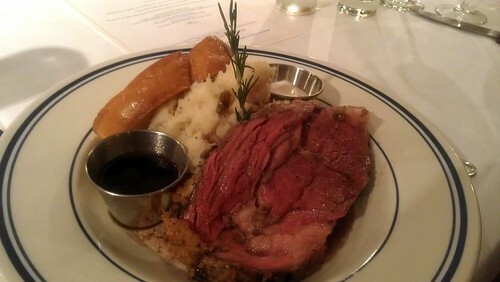 A generous cut of perfectly-roasted prime rib with creamy horseradish and savory au jus, plus a thick cut of Texas toast and two ice cream scoops worth of addictive mashed potatoes (that we later found out was made with LOTS of butter...) In short, solid and comforting steak 'n potatoes fare. 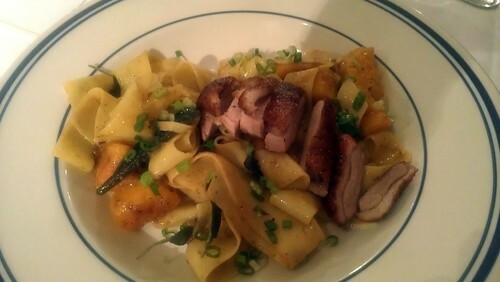 Next we tried the Housemade pappardelle pasta with butternut squash, spit-roasted duck, sage and browned butter - a decidedly 'sweeter' entree thanks to the squash and a hint of sweet spices, the components definitely scream 'Autumn!' and this is an interesting seasonal spin for the pasta dish, though I might prefer this more as a half-portion primi dish than a full-on entree, being one of those pastas that's fun to eat for the first few bites, but a bit overwhelming to finish, though my friend was more than happy to doggy-bag the remainders for lunch the day after. 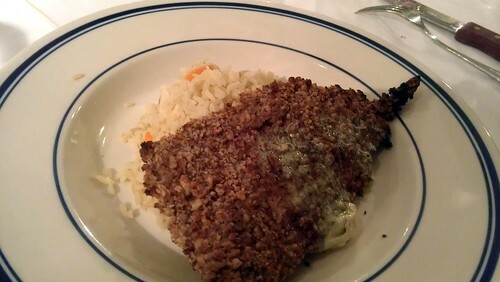 Pecan-crusted rainbow trout with lemon herbed butter and rice pilaf - a straightforward-sounding dish that was excellently executed, the fish was firm and not dried out, and the crust lends a pleasant woodsy, nutty crunch without being too greasy or gritty. The lemon butter was a nice addition, though I think the fish was totally fine on its own. And the pilaf is a decent accompaniment, fluffy and tender, though less memorable of a side dish compared to the buttery taters. Even though we were stuffed to the brim after all those belly-busting courses, I couldn't resist the pie a la mode that came out. Flaky crust, check. Not-too-sweet fruit filling, check. 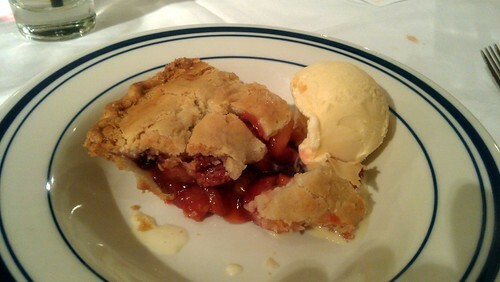 Alas, even with my love of all things sugary, I only finished about half this pie. Of course, as we chatted with the chef & public relations rep throughout and after the meal, they made it known that there's no shortage of incentives to come back. From a fried half-chicken night (Sundays) for $15, to a lunchtime/pre-dinner/late-night happy hour with $4 draft beer, wines and well drinks, and the occasional entertainment events from Monday Night Football to live Jazz performances. Though between the budget-friendliness, deliciously satisfying meals and the MUCH easier parking are all the perks I need to keep me coming back for more! 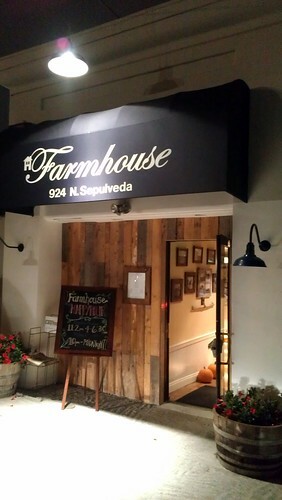 - South Bay Foodies said "given the grill, the cocktails, and the fun farmhouse theme, I’m sure they will be setting the standard for Taverns & Dining Halls for a while." - Gourmet Pigs noted that "if you're looking for a simple meal with great grilled meats, look no further." - LA Weekly's Squid Ink praised their happy hours, mentioning that "there couldn't be a happier place than American Farmhouse Tavern & Dining Hall in Manhattan Beach." 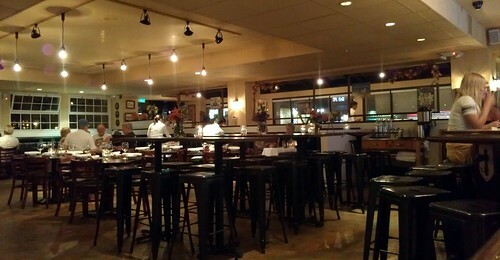 - South Bay Sparkles said "a place to go out for dinner that’s traditional and yet has a few memorable twists."